Give That Dawg A Bone! This time last year Alex Wood was in Athens, packing up his stuff and heading home to Charlotte. There he would wait. He would wait for the major league draft and he would wait to see what lie in store for his baseball future. 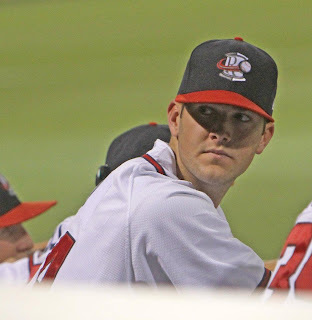 On that drive north, I'm certain that Alex Wood had no idea that just over a year later, he would take the mound at Turner Field. With his mom in tears and his dad hanging over the dugout and taking pictures, Alex ran out from the Braves bullpen at the top of the ninth inning. I can't even imagine what his parents thought an inning earlier when they saw the sign in left field..."Warming Up In The Braves Bullpen #58 Alex Wood". That's probably when mom started to lose it. The pressure was low as the Braves were up 11-3. Perfect situation for the rookie. Wood gave up a single to Colby Rasmus but ended the inning by getting Maicer Izturius to ground into a double play. He was so caught up in the moment that he didn't even think about the game ball. Freddie Freeman, the bobblehead celebrant of the evening, tossed the trophy to his newest teammate. Why now and why Alex Wood? The Braves bullpen became one pitcher short when the team decided to carry three catchers. Additionally, the Braves had suffered two huge lefty-reliever losses to Tommy John surgery. Jonny Venters and Eric O'Flaherty are gone until next year and the Braves were suddenly pitcher-thin. Righty Jordan Walden came off the DL but the Braves still needed another left-handed arm. Alex, with his unorthodox delivery style, had impressed the coaches and players this past spring. The Braves had drafted him in the second round of the 2012 draft and he was pitching well in Double-A Mississippi. So, 24 hours after being called up, Alex Wood made his major league debut. His best friend, former teammate and inspiration, Chance Versey was there early and watched batting practice from the Braves dugout. As he took the field in the ninth, Alex said he could here woofing coming from the stands, very possibly from friends and some Georgia football players who made the trip down from Athens. And then there were the parents. They were fun to watch! Alex summed his night up best. "There's nothing like it. I wish everybody could experience the feeling I had tonight at some point in their lives." There is always a downside for one player when another makes his debut. Third baseman Juan Francisco was designated for assingment in order to make room for Wood. 85th overall selection in the 2012 amateur draft. Redshirted the 2010 season after undergoing Tommy John surgery in 2009. Spent the 2012 season pitching in Single-A Rome. Invited to Spring Training in Orlando this season, then pitching in Double-A Mississippi. Dad is a lifelong Mets (yikes!) fan and as a child, Alex split his loyalties between the two. Hopefully that is now rectified!! As a child I never really understood the true meaning of Memorial Day. In my circle of friends, it always marked the winding down of the school year and the countdown to the freedom that lie ahead in our wondrous summer. Our freedom was just within sight. I'm not sure when it changed. Was it was part of growing up and understanding the sacrifice of others? Was it seeing the first Gulf War coming to life on an office television at my first 'real' job? It doesn't really matter when it happened. All that matters is that it did. Thank you to all who have served and protected the United States of America. You have provided us with a wonderful way of life. Your sacrifices have given us so much. We can never repay you for what you have given us. We can only thank you. And thank you just doesn't seem to be enough. Here are some photos from Military Appreciation Night at Turner Field. ...for I have sinned. It has been four months and one day since my last post. I've let quite a bit of baseball slip by. Spring Training. Opening Day. First two months of the season. I won't give you an excuse. Just my apologies. For those of you who asked where I was, thank you for missing me! That warmed my heart all the way down to the tips of my spikes! The Braves got out the gate in fast and furious fashion. The team won three division series, versus the Phillies, Marlins and Nats (the latter two being sweeps) but were humbled at the end of the month by losing three of four to the Pirates and then getting pummeled in Detroit. That series was painful to watch. The Braves ended the month 15-8 and are 13-9 (so far) in May. We've seen a tough series in San Fran (1-3) and sweeps of the Dodgers and Twins. The Braves have played on the road more than any other team in the majors. 21 games at home and 29 on the road. I really don't understand the rationale of the schedule makers. In fact, it's really kind of bizarre. In one April road trip, the team visited Pittsburgh, Detroit and Denver. Game time temps were often in the 40s or lower and one of the games in Denver was actually snowed out. Meanwhile, Atlantans were basking in an absolutely glorious spring. Sunny, breezy days with highs in the 60s! What the heck were the powers-that-be thinking!?! Ask any team, do you want to visit Atlanta in April or August? April wins hands down. As for Pittsburgh, Detroit and Denver, an August game would be spectacular. One word for the schedule makers. Der. The big story going into spring training was the Upton brothers and since then, the excitement they've created is beyond compare! The energy on Opening Day was unbelievable! The boys lived up to their billing the first week of the season. Facing the Cubs in just the fifth game of the year, the Braves found themselves trailing in the bottom of the 9th. B.J. tied the game with a home run, his first as a Brave. Two batters later, Justin won the game with his own home run. With their parents in the stands, the Uptons became only the fourth pair of brothers to hit home runs as teammates in the same inning. It's happened once before for the Braves. Hank and Tommie Aaron did the same, 41 years earlier. Tim Hudson won the 200th game of his career game on April 30th. And the game he pitched was an absolute gem! To ensure that the third attempt was the proverbial charm, Huddy helped himself out by hitting a double and then going yard! Hudson was philosophical about waiting for the milestone and was thrilled to get the win at home. His battery-mate said catching the game was an honor and privilege. That's one step closer to Cooperstown for one of the game's most underrated players. See, this is what happens when I don't write for awhile. This post is getting waaay too long! I'll cut to the chase on the rest of these. Craig Kimbrel notched the 100th save of his career. He's blown two saves so far, but true to form he's bounced back just fine from each. It took until May 18th for the Braves to start their 'true' starting line-up. 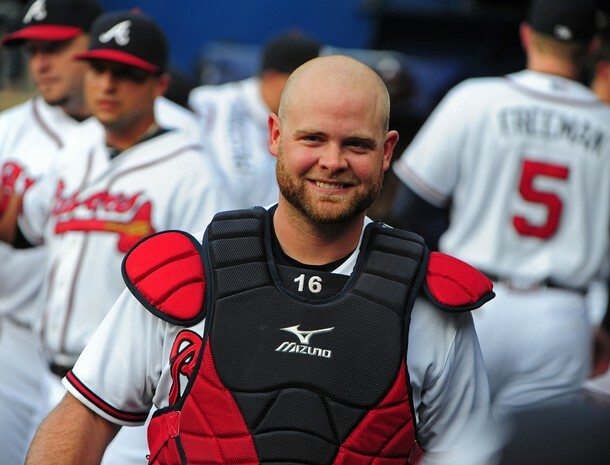 The season began with Brian McCann on the DL from off-season shoulder surgery. Just before B-Mac's return, Jason Heyward went out due to an appendectomy. Overlapping those two was Freddie Freeman's stint on the DL. It took little while but the roster looks great! Evan Gattis is baseball's surprise star and the biggest story in the majors right now. He's batting .256 with a .576 slugging percentage, an .883 on-base percentage and he leads the Braves in RBIs. Evan bests all rookies with 10 home runs, including one grand slam. He's playing two positions, catcher primarily and then left field. He's knocked in eight runs on three pinch hit appearances. El Oso Blanco's story is one of folkloric proportion and that has earned him is own post, coming very soon! Chris Johnson has turned out to be the sneaky surprise of the Upton/Prado trade. Chris is at the top of the league in batting with his .352 average and he's playing a great third base. His bat could possible seal the deal in becoming the teams every day third baseman. Justin Upton is leading the NL in home runs with 14. In all of baseball, he's tied with Miguel Cabrera and only Chris Davis (16) has more. Ramiro Pena is clutch! The former Yankee is built to play in the National League and he comes through every time he hops off the bench. He's a huge threat and the rest of the NL is taking notice. On the injury front, the Braves have lost both Jonny Venters and Eric O'Flaherty to Tommy John surgery. On a brighter note, Brandon Beachy should be back around the All-Star Break. The Braves are carrying three catchers on the 25-man roster. 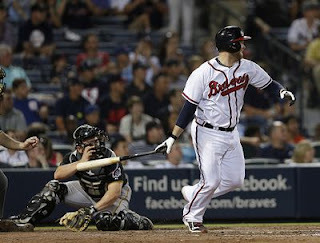 Two Braves pitchers have hit home runs this season, the afore mentioned Hudson homer and Mike Minor, who got the first of his career, a two-run dinger last night. The biggest surprise of all to me? Jordan Schafer may have actually grown up and gotten his act together. Who da thunk it? Not me!! Gotta go! It's almost game time! The prospect thrilled me! Two Uptons in a Braves outfield!?! The rumor of serious trade talk between the two teams started earlier this week and since then I’ve been holding my proverbial breath, waiting for the announcement. Adding Justin, the 25 year-old Diamondback outfielder to a roster that just signed his 28 year-old free-agent brother B.J. a mere eight weeks ago. Was it too much to hope for? Justin’s name had surfaced in serious trade talks twice within the past six months. Immensely talented, he had reportedly fallen out of favor with the team’s GM. B.J. was honest, once the ink was dry on his contract, he and Justin had talked about the possibility of playing together in Atlanta someday. I don’t know if either of the two ever dreamt that the wait would be this short. The Upton brothers, if they live up to their potential, will greatly strengthen the Braves defense and offense. The Uptons bring both speed and power to the team. Their talents, combined with those of Jason Heyward, gives the Braves what looks to be the strongest outfield in the majors. Offensively, they have a lot of bang in their bats. The downside? Strikeouts. And lots of ‘em. I have to admit, as excited as I was by the mornings events, when I heard the details, my heart sank. Martin Prado was part of the deal. Martin Prado was, without a doubt, the hardest working, most versatile player on the Braves roster. During the 2012 season, Martin played five different positions. Left field, third base, shortstop, second base and first base. Like I said, versatile. He played wherever the team need him to, without hesitation or reservation. He kept his head down and played hard every game. He was one of the most popular players in the clubhouse and one of the most respected. Ego? He didn’t have one. In three of the last four seasons, Martin Prado ranked either first or second in team hitting. His numbers? In 2009 .307, in 2010 .307 and in 2012 .301. Consistent. You’re wondering about 2011? Missing more than a month of the season battling a staph infection, Martin hit .260. In his first game back from the DL he went yard. Martin has a career .295 average, with 52 home runs, 308 strike outs and 286 RBIs. He was an All-Star in 2010. All along, I believed that Martin Prado would inherit third base from Chipper Jones. He earned with his play on the field and his loyalty to the team. I felt great about the Braves infield. It was only the outfield that needed to be shored up. I hate to see the Braves lose a player like Martin Prado but as we are regularly reminded, baseball is a business. Martin Prado was consistent. The word most often used to describe Justin Upton? Inconsistent. But a change of scenery, wearing the uniform of a team that truly wants him and playing alongside his brother, that could help create the consistency. What I’ve found most interesting over the past 24 hours, is the reaction of media outlets versus fan reaction. I’ve watched, listened to and read everything possible. The national media loves this deal, the local media loves it more. Words like "blockbuster" and "coup" are being used. The pundits are saying the Braves will have the best outfield in all of baseball and they’re not going to let the Nationals win the division and get stuck playing in another Wild Card game. The fans? That’s another story. Although there’s a great deal of excitement, there is a huge sense of dismay in letting Martin Prado go. Many, many people think that this trade could come back to haunt the team. Why doesn’t the national media see it that way? Because Martin Prado is one of the most underrated players in the game. He hasn’t been playing in the biggest market and most of the headlines have gone to Chipper, Craig Kimbrel, Kris Medlen and Jason Heyward. Not that they don’t deserve the headlines, but Martin has always done the same thing. Kept his head down and played hard, every single day. Braves fans know what we’re losing. The new wrinkle? Instead of worrying about left field, the Braves can now focus their concerns on third base. As it stand now, Chris Johnson and Juan Francisco will platoon at third base. I don’t feel good about it, but then I have little confidence in Francisco. As for payroll, the Braves are in good shape. They still have $10 million of a $98 million payroll left. All emotion aside, the Atlanta Braves outfield became much stronger today. The offense? Maybe. Again, if everyone lives up to their potential. The Braves get Justin Upton (LF) and Chris Johnson (3B). The Diamondbacks get Martin Prado (OF/IF), Randall Delgado (P), and minor leaguers Nick Ahmed (SS), Zeke Spruill (P) and Brandon Drury (IF). Many an athlete has been called 'The Man'. But really, there is only man. Baseball lost one of it's finest yesterday, one of the game's greatest ambassadors, a living legend and the truest of gentlemen. Stan Musial. And America lost another cherished member of our Greatest Generation. Stan Musial had a wonderfully full life. He lived to be 92 years old. He played his entire career with the St. Louis Cardinals and he was an integral part of the organization until he drew his last breath. He was married to his beloved Lil for 71 years. They had 4 children, 11 grandchildren and 12 great-grandchildren. I'm not old enough to remember Stan as a player. When I began to really follow baseball, he was already a long-time Hall of Famer. But even as a player of yesteryear, I knew how special Stan Musial was. He was always mentioned in the same breath as the other greats of his era. Aaron, Mantle, DiMaggio, Banks, Mays and Williams. I've oft said that no one should ever be placed on a pedestal. Whether it's an athlete, entertainer or world leader, everyone is human and everyone makes mistakes. It's all part of being, well, human. It's fine to admire someone for an aspect of their life, but never should they be considered perfect or infallible. By doing that, we set ourselves up for disappointment. All that said, Stan Musial, by all accounts, seems pedestal worthy. Stan Musial was a humble and unassuming man. He was a consummate professional who played the game right. He took "a break" from baseball at the top of his game to serve his country in World War II. He supported the integration of baseball and Bob Gibson spoke many times of how Stan helped establish a warm chemistry between black and white players in the Cardinals clubhouse. And he loved to play the harmonica. Stan retired from baseball in 1963. At the time, he held or shared 17 major league records, 29 National League records, and nine All-Star Game records. He was elected to the Hall of Fame in 1969 (his first year of eligibility) on 93.2 percent of the ballots. He never left St. Louis, becoming a business leader in the community. From 1964 to 1967 he was the Johnson administration's physical fitness advisor. He served as a Vice President in the Cardinals front office from 1963 to 1966 and then as the team's General Manager in 1967. That year the Cardinals won the World Series. How beloved is Stan Musial in St. Louis? There is not just one, but two statues of him at Busch Stadium. In his retirement, he rarely missed an Opening Day or any Cardinals celebration. He was cherished and revered by all the Cardinals players who followed him. In response to a massive campaign by Cardinals Nation in 2011, Stan Musial was awarded the Presidential Medal of Freedom, the highest honor an American civilian can receive. "Here stands baseball's perfect warrior. Here stands baseball's perfect knight." Today, we like to think that we are watching the greatest players that baseball has ever produced. They don't hold a candle to Stan The Man. Their accomplishments pale in comparison. - Stan Musial played 22 seasons with a lifetime .331 batting average, a .417 on-base percentage and a .559 slugging percentage. - Stan Musial was the National League MVP in 1943, 1946 and 1948. He came in second on the ballot four times. - Stan Musial won the National League batting title in 1943, 1946, 1948, 1950, 1951, 1952 and 1957. - Stan Musial played in four World Series, 1942, 1943, 1944 and 1946. His team won three of the four. - Stan Musial played in 24 All-Star Games. - Stan Musial missed the entire 1945 season as he served in our nation's Navy during World War II. When he returned in 1946, he won the National League's MVP award. He also won the National League's batting title and the St. Louis Cardinals won the World Series. Think about it, he achieved three of baseball's biggest accomplishments while not playing the entire previous season. - Stan Musial never struck out 50 times in a season. - Stan Musial led the National League in almost every hitting category for at least one year, except home runs. - In 1948, Stan Musial had four five-hit games. He batted .376 for the season and led the league in hits, total bases, doubles and triples. He hit a career-high 39 home runs, falling one short of winning the Triple Crown. - In his final at-bat, Stan Musial hit an RBI single past Cincinnati's rookie second baseman, Pete Rose. 18 years later, Rose would break Musial's 3,630 hit record. - Stan Musial played in 3,026 games. He made 12,717 plate appearances, hit 475 home runs, had 1,951 RBIs and 78 stolen bases. - Stan Musial had exactly 1,815 hits at home and exactly 1,815 hits on the road. - Stan Musial was a first ballot Hall of Famer, ranking 19th all-time in most votes received. At the time of his induction, only five players had received more votes. Ty Cobb, Babe Ruth, Honus Wagner, Bob Feller and Ted Williams. I found some beautiful tributes to Stan today. Some I'd like to share. "I never heard anybody say a bad word about him — ever." "It is such a sad day, but I am so blessed to have spent time with him the last 12 years. He blessed my life, and many, many lives in baseball during his career, and after his career. He touched so many lives. He means as much as Roberto Clemente does to Latin people. Thank God I had the opportunity to know him. I wish my kids had the opportunity to be around him, because that's how I want my kids to live their lives. I want them to be like Stan Musial. Not the baseball player. The person. That's the respect I have for that man. I will cherish my friendship with Stan for as long as I live." "I knew Stan very well. He used to take care of me at All-Star Games, 24 of them. He was a true gentleman who understood the race thing and did all he could." "We have lost the most beloved member of the Cardinals family." - William DeWitt Jr. Cardinals owner. "Major League Baseball has lost one of its true legends in Stan Musial, a Hall of Famer in every sense and a man who led a great American life. He was the heart and soul of the historic St. Louis Cardinals franchise for generations. As remarkable as 'Stan the Man' was on the field, he was a true gentleman in life. All of Major League Baseball mourns his passing." "St. Louis has been lucky to have a player like Stan Musial. He will always be Mr. Baseball. It's a very big loss. You can go around the world and you'll never find a better human being than Stan Musial." "Stan was a favorite in Cooperstown, from his harmonica rendition of `Take Me Out to the Ball Game' during Hall of Fame Induction Ceremonies, to the reverence he commanded among other Hall of Fame members and all fans of the game. More than just a baseball hero, Stan was an American icon and we will very much miss him in Cooperstown." "Stan will be remembered in baseball annals as one of the pillars of our game. The mold broke with Stan. There will never be another like him." I had every intention of writing about Earl Weaver today. With all due respect to the Oriole's skipper, when I read of Stan Musial's passing, I was compelled to write about him first. Two legends, two Hall of Famers, two baseball icons lost on the same day. I will pay tribute to Mr. Weaver soon. He deserves nothing less. With the unveiling of the 2013 Baseball Hall of Fame ballot, there was nary a doubt in my mind that this class of candidates would be the most controversial in the game's history. Some of the players eligible for baseball's greatest honor are mired in sports biggest and darkest controversy. This ballot will be notorious for being the one that opened the floodgate of players mired in the steroid controversy. Mark McGwire is making his seventh appearance on the ballot and Rafael Palmeiro his third. But this year they are joined by Sammy Sosa, Roger Clemmens and Barry Bonds. All players who greatly tarnished the image of the game. With these firsts, there is a last. Dale Murphy is making his 15th and final appearance on the ballot. That's as many times as a player is allowed to appear. I could write a tome about Dale Murphy. I could give you his stats. I could describe the player who for years was the lone bright spot on a terrible Atlanta Braves team. I could talk about the kind of player he was, the leader he was in the clubhouse and how he lived his life off the field. But I cannot do that better than Dale's son Chad. In mid-December, Chad wrote an open letter to the Baseball Writers Association of America, the voting body for the HOF. It speaks for itself. • Back-to-back NL MVP 1982, 1983 (1 of only 12 players-and the youngest in history at that time-to accomplish this). • 7-time NL All-Star (top NL vote-getter in 1985 and a starter in 5 of those games). • 4-time Silver Slugger Award winner. • 5-time Gold Glove Award winner. • 6th player in MLB history to reach 30 home runs/30 stolen bases in a single season. • Only player in history to compile a .300+ batting average, 30+ home runs, 120+ runs batted in, 130+ runs scored, 90+ bases on balls, and 30+ stolen bases in a single season, 1983. • Led MLB in total bases during the span of 1980-1989 (2,796). • 2nd (only to HOFer Mike Schmidt) in total home runs from 1980-1989 (308). • 2nd (only to HOFer Eddie Murray) in total runs from 1980-1989. • 1st in total home runs from 1980-1989 among all Major League outfielders (308). • 1st in total RBIs from 1980-1989 among all Major League outfielders (929). • 2nd in total hits from 1980-1989 among Major League outfielders (1,553). • 2nd in total extra-base hits from 1980-1989 among Major League outfielders (596). • Played in 740 consecutive games from 1980-1986 (11th longest streak in history at the time, and 13th today. Only missed 20 games total between 1980-1989). • Reached base in 74 consecutive games, 1987 (3rd longest streak in Major League history). • 398 career home runs (19th in Major League history when he retired, 4th among active players). • .265 career batting average. • Sports Illustrated's "Sportsmen of the Year" Award, 1987 (represented baseball as the "Athlete Who Cares the Most," along with U.S. gold-medalist Judi Brown King, Kenyan gold-medalist Kip Keino, and others). • Lou Gehrig Award, 1985 (given to the player who most exemplifies the character of Lou Gehrig, both on and off the field). • Roberto Clemente Man of the Year Award, 1988 (given to the player who "best exemplifies the game of baseball, sportsmanship, community involvement and the individual's contribution to his team"). • Bart Giamatti Community Service Award, 1991. • Jersey number "3" retired by the Braves, 1994. • Inducted into the World Sports Humanitarian Hall of Fame, 1995 (induction class with Roberto Clemente and Julius Erving. One of only 8 baseball players inducted in the Hall's history). • Inducted into the Little League Hall of Excellence, 1995 (joining Mike Schmidt, Kareem Abdul-Jabbar, Nolan Ryan, and others). • Inducted into the Georgia Sports Hall of Fame, 1997. • Inducted into the Oregon Sports Hall of Fame, 1997. • Inducted into the Braves Hall of Fame, 2000 (joining Phil Niekro and Hank Aaron, among others). • Founder of the I Won't Cheat Foundation in 2005, whose mission is to encourage character development among youth. Next, I really want to dive into his sabermetrics, starting with his JAWS, WAR, and WAR7, and then moving on to his JPOS, WPA, OPS, and-last but certainly not least-the all-important holy quadrinity of VORP, GORP, SCHLORP, and THUNDERCORK. Look, I have no desire to get into some sort of cryptic mathematical argument for my dad's induction into the Hall of Fame. The numbers are what they are-maybe they're strong enough for the Hall on their own, maybe not. Whatever. The bigger issue, to me, is this: what happened to three of the criteria listed under the rules for election, namely, integrity, character, and sportsmanship? Gone but also forgotten? No doubt a player's stats (i.e., "record" and "playing ability") are a crucial part of the equation, but that's just the point: we're talking about an equation here, folks. And we've got a serious case of missing variables. Where'd they go, friends? But hold on, maybe not fine. The character clause isn't just totally MIA. In fact, it seems to come roaring back into the conversation every so often when certain players are mentioned, as if judging character weren't so difficult after all. And, mysteriously, this only seems to happen in cases where the point is to keep someone out (see: Pete Rose, Shoeless Joe Jackson, the 'Roid Boys). Indeed, then it gets easy: Gamblers? Out! Cheaters? Be gone! Vehement racists? Well, okay, you can stay (lookin' at you, Cap Anson). Of course, the obvious question here is from whence this biased, one-way application of the character clause? Here's one possibility. In psychology there's a well-known and well-established finding known as the "bad is stronger than good" principle. In 2001, Roy Baumeister and colleagues reviewed a large number of studies and found overwhelming evidence that negative events figure more prominently in our minds-and are hence easier to recall-than positive ones. For example, the authors cite a 1978 study by Brickman and colleagues where they interviewed people who one year previous had either won the lottery (a supposed "good" event) or had been paralyzed in an accident (a bad event). What they found was that the intense negative feelings associated with being paralyzed had not abated a year later, while the positive feelings from winning the lottery had almost totally disappeared and the details of the experience entirely forgotten. The upshot here is that we, as human beings, adapt very quickly to good events, so quickly, in fact, that it doesn't take long for us to forget those good things completely. And isn't the uneven application of the character clause perhaps an illustrative example of this quirk in human memory and reasoning? Bad behavior (some of which-e.g., Joe Jackson-happened, er, nearly 100 years ago) appears to occupy a more central place in the minds of voters than the exemplary behavior of players like Dale Murphy. As the voting criteria currently stand, however, there's no doubt that a fair, holistic assessment of my dad's playing years would reveal that he is exactly the type of player we should want to represent the game of baseball for future generations. As the criteria suggest, HOF membership is not the equivalent of a career-long MVP award; rather, it's an honor bestowed upon players for the legacies they've left behind. In my dad's case, that's a dang near unimpeachable legacy indeed. As for the players of the steroid era? The debate, discussion and controversy is already at an all-time high and it will continue for years. This is only the beginning of the onslaught. I'd love to know what you think. Here's a link to an interview with Chad from “The Bill Shanks Show” on WPLA Fox Sports 1670 AM in Macon. It's a great listen.